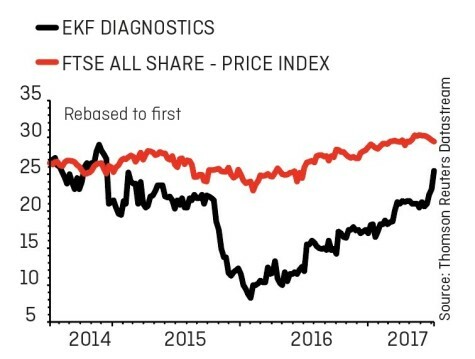 Things are looking up for medical diagnostics specialist EKF Diagnostics (EKF:AIM) as its latest trading update (6 Jul) triggered a round of earnings upgrades, putting the spotlight on strong sales and profit growth potential over the next few years. N+1 Singer analyst Chris Glasper upgraded earnings before interest, tax, depreciation and amortisation (EBITDA) forecasts by 10% to £9.6m for 2018. He also hiked EBITDA expectations by 9% to £10.4m in 2019. The company develops, makes and distributes chemical reagents and analysers that measure glucose, lactate and haemoglobins among others. Its in-vitro diagnostic (IVD) products are used in GP surgeries, pharmacies, blood banks, clinics, hospitals and laboratories. In the year to 31 December 2016, adjusted EBITDA was £6.1m, up from a loss of £0.3m in 2015 helped by a 16% uplift from currency movements. The positive trend has continued. EKF says sales were ‘notably strong’ in June 2017 and this was driven by incremental organic growth rather than major one-off tenders. As a result, 2017 EBITDA will be ‘comfortably ahead’ of expectations, it says. Panmure Gordon analyst Julie Simmonds has upgraded EBITDA forecasts by 8% to £8.6m for 2017. The analyst flags improved margins thanks to an increased focus on core product lines, which should help to drive growth in the future. In particular, she highlights haemoglobin measurement device HemoPoint H2, diabetes monitor Quo-Test and testing reagent for ketosis, Beta-Hydroxybutyrate (BHB). 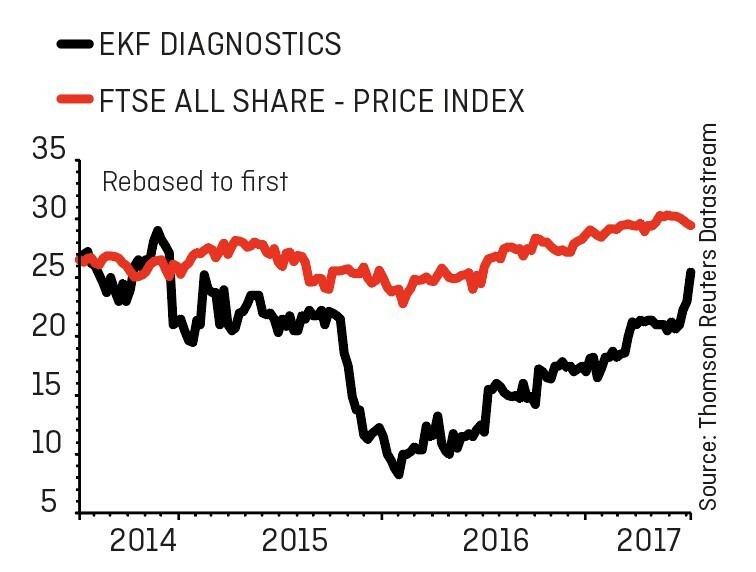 EKF chief executive Julian Baines says the company’s recurring revenue model and global market focus has driven its momentum over the last 18 months. The medical diagnostics company derives 50% of its sales from the US and also does significant business in Saudi Arabia and Eastern Europe. With £4m in cash, Baines says the priority for EKF is to continually invest in the business and undertake share buybacks. He has ruled out any acquisitions. EKF currently trades at 23 times forecast earnings per share for the year to 31 December 2017. While that is a rich rating, the company is poised for high earnings, sales and profit growth in the future.